Regardless of the percentage of heat we lose from our heads, we’ve probably all experienced relief from the cold when we’ve pulled on a hat on a chilly day. We humans got short changed in the hair/fur department. We have to depend on adding clothing layers to protect us from the elements. We lose heat from any exposed or inadequately clothed part of our body. A wool or synthetic stocking cap or beanie works well for insulating your noggin, as long as you can keep it dry. When they get wet, they lose a lot of their insulation value, and you also get heat loss through evaporation. 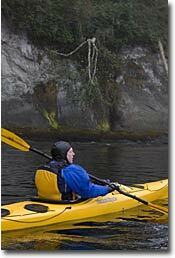 The best insulated headwear choice for boaters is one made of neoprene, a synthetic rubber material. When it’s manufactured as a closed-cell foam, with thousands of tiny gas pockets, it’s a very efficient insulator. A neoprene top is a “wetsuit for your head.” Wet or dry, it minimizes heat loss and helps you stay more comfortable. Every cold weather boater should have one when they hit the water! Oh, and speaking of hair and fur, you beautifully bald folks aren’t at much of a disadvantage over the fully haired. The hair on our heads doesn’t provide much insulation. Animals that are adapted to the cold, like sled dogs and polar bears, have multiple types of hair, in dense layers, for insulation. Ever seen a Malamute shed its winter coat? It’s wall-to-wall dog hair!